We present a Petri net based framework called G-Net for the modular design of complex information systems. The motivation of this framework is to integrate Petri net theory with a modular, objectoriented approach for the specification and prototyping of complex software systems. We use the client/server example to illustrate the G-Net specification of distributed systems, and how such a specification can be translated into a Predicate/Transition net for formal analysis. 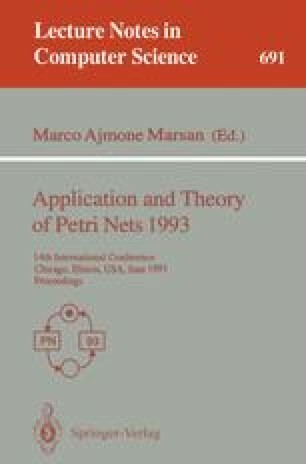 The differences between G-Net and hierarchical Petri net, as well as some limitations of the transformation technique, are then discussed. The authors would like to acknowledge the financial support of CNPq/Brazil in the form of scholarship 201463/91-1 and 201462/91-5.